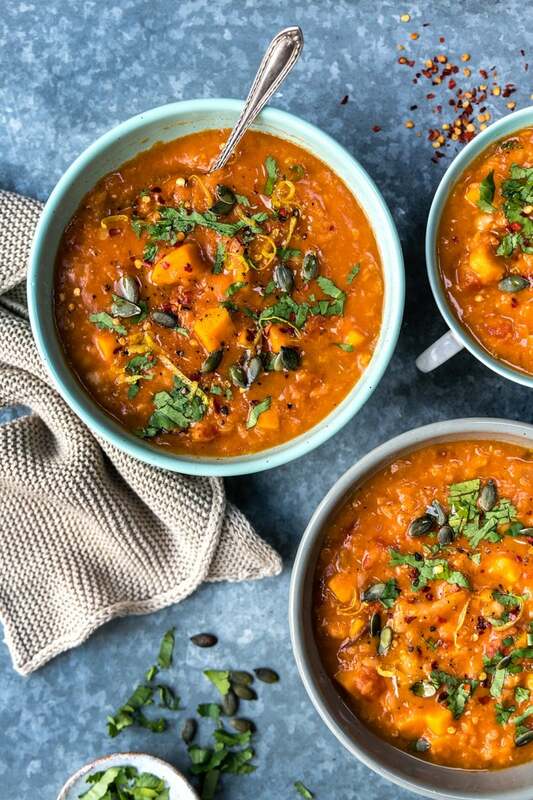 This delicious and hearty pressure cooker sweet potato, chickpea and red lentil soup cooks in just 10 minutes in your Instant Pot. Healthy, vegan, and gluten free, it is guaranteed to become a family favourite! Just as the days were getting brighter and warmer, the weather did a 180° and we had snow. SNOW! Snowing in London happens so rarely as to still be a huge novelty, but this time around I am more than ready for springtime to arrive. You hear that springtime? Come back please! The only plus to the unseasonal snowfall, has been the extra family time we have enjoyed thanks to ‘snow days’, since everything in London comes to a standstill at the first sighting of snowflakes. Our pressure cooker has been working overtime to keep us fed and warm with a variety of stews, chilis and soup – I think I am now figuring out why some people have as many as three pressure cookers on the go at once. Cold weather = soup weather and I have a new soup obsession – sweet potato, chickpea and red lentil soup. OMG it is so good that even my husband who thinks soup ‘is not food’ came around. Have made this baby twice in less than a week, that’s how yummy it is. This pressure cooker sweet potato, chickpea and red lentil soup straddles the line between soup and stew – it is very thick and really satisfying. If you wanted to add a bit less stock and serve it over rice or quinoa, then I say go ahead! You could also pack it with even more nutritious yumminess by adding some leafy greens – stir in some chopped spinach or kale right the end and sauté until wilted and soft. Kale will require longer cooking than spinach, make sure to remove the hard stems because otherwise it will be chewy! I used ready cooked (canned) chickpeas here, but you could also use dried chickpeas if you wanted. If you use dry chickpeas they will need 40 minutes high pressure cooking unsoaked and 25 minutes cooking if soaked overnight (see recipe card notes). Don’t forget to reserve the chickpea brine (aquafaba) – it may come in handy if you want to make vegan macarons! What are you waiting for? 😉 Just kidding, this soup is extremely easy to make on the stovetop! Simply heat the oil in a deep pot and cook as in the main method. Simmer the soup for 20-25 minutes until the sweet potatoes and red lentils are cooked. This was relatively eay and delicious. Packed with nutiyion and a great way to use up sweet potatoes. My only change was to sauté the onions a bit before throwing in the much more delicate garlic, ginger & spices. A few zaps with the immersion blender after cooking turned this into a thick, savory stew. Will keep this recipe in regular rotation. Yum! I made this to store in the freezer for an emergency meal. However, it was so good, I couldn’t stop eating it. There were leftovers and they were a hit with the husband, still waiting to find out what the kids think. This will be my first recipe made in an IP. Mine is a 3 at so do I need to cut recipe in half? Thanks! This looks killer delicious! I don’t think so – but I haven’t got first hand experience with a smaller pot. Can you check against the maximum level of liquid for your pot? When I make it the level is only about half full. Please let me know how you get on! Thanks for this wonderful protein-packed recipe! Like many IP users, I had chick peas already cooked in my fridge. and this was a great way to utilize them. I finished with some smoked salt and it was really, really good served with some sprouted rye bread and a salad, and it was just as good the next day. Thanks again! How might I adjust this recipe if I were stranded without access to chickpeas. Could you guide me as to how long in the slow cooker? And also would I need to adapt liquid levels etc? I want to cook today and stove top is not possible as am out. Hi there! I am new to the instant pot and not quite ready to give up my meat-eating habits. Can you please advise on how I could include some thawed chicken breasts into this recipe? Thanks so much! You could use chicken tenders. Sauté them for 5 minutes first, chop into bite-sized pieces and proceed with the recipe. Add with other ingredients and cook for 9 minutes instead of 5. This should work however you couldn’t blend the soup at the end (with chicken pieces in it). Let me know if this works! Having recently come across a soup like this in a café, I set myself a task to cook it at home and this recipe sounds very like it. One problem though, I don’t have a pressure cooker. Could you give the method for either hob cooking or in the slow cooker? This soup is fantastic! I didn’t have any coriander and had to use ground ginger instead of the fresh ginger or ginger paste, but it still turned out delicious! I will be making this often! I’ve made this soup a few times and each time I think it’s better than the last. Now I make extra to keep in the freezer. Though I rarely make the same thing twice, this is a regular for us. BTW, I too use my 6 qt. instant pot. Thank you for a wonderful recipe. Thanks Elaine that’s so wonderful to hear!! Delicious! I’ve made this twice. My only changes are to use a whole can of chickpeas and add extra lemon. Thanks for the amazing recipe. Super filling and satisfying. Thanks for the comment Anna! I guess in the UK it is a full can of chickpeas – guessing this is not the case everywhere? That soup looks stunning Lucy. I am sitting here at my laptop feeling rather chilly even though the heating is on. I would love to tuck into that right now. Shared! Looks fantastic! One concern. You wrote, with regard to chickpeas, “If you use dry chickpeas they will need 40 minutes high pressure cooking unsealed ” — did you mean “unsoaked?” Thanks! Yes unsoaked chickpeas will need about 40 minutes cooking. Soaked about 20-25.